Treadmill Reviews, Fitness Equipment reviews. This is a full commercial machine. This was one of the best rated by RUNNER'S World. To land a a full commercial Life machine at $3499 is an incredible value. Runners World Stated, "This is the treadmill you need if you are planning on racing up Mt. Washington" That is a great endorsement if you are a runner and looking for a great machine. Landice has also won Consumer Reports top choice more then any other treadmill. Plus: The XT485 provides a comfortable, stable surface underfoot for runners of all sizes. The controls for speed (12 mph max) and incline (0-15%) are conveniently located on the handrails, but can be turned off if you frequently hold on to that area. From the easy-to-read console, speed and incline can be set using any of the 0-9 "quick keys", press either the speed or incline button, then one or two digits corresponding to your setting; "quick speed" plus 6 and 5 would set the belt speed to 6.5 mph. This is easier than pressing an up or down button to scroll through to your desired setting. Minus: The most common complaint we heard from testers was that the cup holders on the XT485 are too shallow, causing a water bottle to bounce around. Tester Says: "The speed/incline buttons on the arms were nice." ROBERT REESE, 28, a 2:53 marathoner from Emmaus, Pa. Besides being Consumer Reports #1 Rated machine the past 4 years, Runner's World also highly recommends this machine. If the only complaint found is that the cup holders are not deep enough for a big water bottle then you have a Home Run of a machine. "If you want the best and can afford it, the L7 is the bad boy." "No frills, no gadgets, no gee-whiz-look-at-me console. The 9.23 is meant to do one thing: perform. You want to go faster? Press the arrow up. It's one of the most responsive treadmills we tested; this machine catches up to speed changes in a hurry. And because the engine can hit five-minute pace, anyone who's not training to medal in London will find all the speed they need. Of course, when you do push the pace, be careful: There are no side handrails. If you lose contact with the console during your race simulator, you'll give new meaning to the phrase "off the back." With no siderails, this is a head scratcher. They have since discontinued these units. "Sleek" is the word we heard most about this machine's console. The button labels change logically according to menu options, so there's limited "button clutter" and plenty of eye-catching empty space that serves to make the machine approachable to novices. Our testers also liked the machine's downhill capability, which goes to -2 percent, and the selection of workout programs that focused on specific body parts like glutes. These machine come in at a lofty $5999. "The T5 remembers your preferred settings for a quick start at any time. With just the push of a button, you'll be back at the speed and incline you were at before the kids' demand for chocolate milk came in. When you do make adjustments, the panel reacts quickly to the touch. "It was a great ride," says David Graf, RW's senior multimedia producer. "Cushioned without feeling mushy, the machine has a stable, supportive surface." 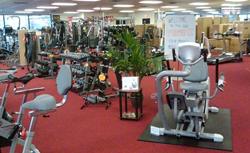 Life Fitness makes great commercial machines, but their home units are made in Asia and recently lowered their warranties. They should stick to the commercial world. "A big, touch-sensitive color display lets you clearly see where you are going. The 10-inch tablet computer integrated into the machines console connects you to the Internet and the iFit system, and leverages Google Maps to replicate a real-life route anywhere in the world. The system automatically adjusts the speed and incline of the machine to match the terrain on-screen. Testers appreciated the one-touch keys to quickly adjust belt speed (0 to 12 mph) and incline (-3 up to 15 percent). The 3.8-horsepower motor will keep the belt spinning smoothly, even for bigger runners. FYI- This is not a commercial machine. Not even close. Look up Norditracks rating on the Better Business Bureau. We will not sell or support this brand. (It is an Icon brand.) Enough said. "Hi all, new to this forum. We just got a replacement F80 treadmill for one that we cracked the deck on after 1000 or so miles - fortunately we got an extended warranty. (Not impressed with this treadmilll I will say) The new one feels funny to run on and investigating shows the deck not to be level. If I put a level on it, it is not flat, it is perhaps a half inch off or so over a two foot level higher at the front. "Well guys my deck just cracked in the middle and almost broke in half..I have put about 3 decks on this tread mill and have replaced lower power board and even sent me a new unit back in 08'..Now it appears that the front two rubber shock absorbers are loose..They pull off while the others are attached..But they are still under there the whole time however I guess the raise up and down with deck while running and that is what caused the split? Don't know but just took the deck off and looked at my old one I had from the previous change and its quiet a bit thicker compared to this..I wished all the old posts were still here so I could look back and see what all I have done to this thing. The other decks just had bad surface wear. Be careful of these lower budget machines... Remember- They offer Commision to anyone who wants to sell them on-line- This is why people try to rate them high. A sporting goods treadmill will not hold up! Plus: Say you're running and the phone rings. You hop off the 'mill to answer. On most machines, the belt keeps spinning, which is dangerous especially if you have kids playing nearby. But the TR5000i has a safety-stop feature that automatically shuts off the engine when it doesn't sense a runner on the belt. During workouts the console sends data to a USB stick, tracking your heart rate (sensors on the arm-rails make this especially easy) and other vitals. You can pair the treadmill with an optional scale to record changes in your weight and body-fat percentage. Minus: Quick keys are available only for pedestrian paces (3-6 mph). Icons on the display screen are difficult to decipher. Tester Says: "Provides a quiet platform and user-friendly controls that are great for walking or jogging." "I just purchased my first home treadmill myself, and went through what seems to be the same process you are. I ended up with a Smooth Fitness unit, purchasing direct from them. The treadmill itself meets my needs. The purchasing experience, however, was the worst I've had in a decade. Doing it all over again, I'd make sure I was working with somebody local, and as a plug, I'd avoid Smooth like the plague." We would agree- Way too many complaints! 1) The dealer is as important for the long haul as the machine. Literally. Someone to advocate for you, or frankly, who is invested in keeping you happy as a repeat purchaser and referrer is incredibly helpful. TREADMILLS have so many issues! Some of the longer lasting dealerships in the Fitness industry track their referral chains very carefully and invest in the long term clients. 2) Find out who services the machine. An in-house company will be invested with the above mentaility and often will have better part support; but there are many quality service companies. If you are looking at purchasing a machine from a company who subs out the service, call the company who is going to fix the machine and get some information from them. 3) There is no such thing as a maintenance-free treadmill. No. Such. Thing. Friction is the enemy of a treadmill, and it is normally better to buy from a company and brand that deals with this honestly from the outset. There are brands with well built componentry that will go a long time before they start to exhibit issues, but the lifespan of these machines would be a lot longer if they were maintained, and it is still a maintain vs. failure equation. Winner of the Consumer Choice Award- Best Budget Treadmill ! "Well worth considering if you are in the $1500 price range. Stands above most of the clutter in the market. The Spirit XT285 is an excellent choice. At $1,499, there are a lot of reasons to love this treadmill. It's only $200 more than the XT185, and it provides a better motor, slightly improved cushioning, a bit more durability, and a longer warranty. This price range has many quality machines, but there are several reasons to like this model above most of the others. The walking area is a good size. This should still provide plenty of room for larger users to run on comfortably. A nice motor powers this machine. This treadmill has greater power producing capabilities than many of the models that sell for more than $2,000. Speeds of up to 12 mph are attainable, so even experienced runners should have no problem challenging themselves. A commercial cushioning system comes on this mode. Six evenly spaced shocks are used to reduce the impact that running has on your joints and back. As far as projected reliability is concerned, this machine does quite well. You'll have to spend at least a few hundred dollars to find a treadmill that has a significantly longer life expectancy than this one has. The quality of parts used is also great for this price range. The warranty on the Spirit XT285 is great. Labor is covered for 1 year; parts are covered for 10 years; and the motor, deck, and frame are covered for life. You're not going to find a better warranty than this on a treadmill this affordable." Hi... There are many other treadmills and reviews.... Your best bet is to come down to New England's Largest Showroom to check out all the models. Our non-commissioned sales approach will truly make your buying experience simply awesome!